The Unique Duo with female Saxophonist! 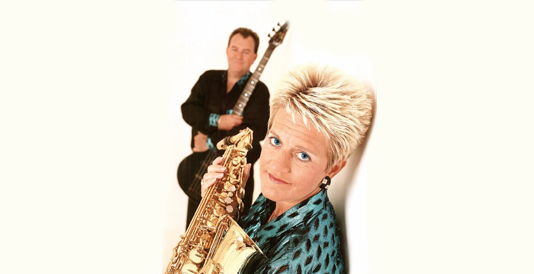 With a wealth of experience in entertainment, Ray Davies and Christine Crook are a professional two piece band with a six-piece Sound! Sensational Live Vocals, Guitar & saxophones coupled with a lively rapport with the audience, "Obsession" aim to give you a night to remember! "Obsession" performs a wide range of music from cool jazz to everyone's favourite hits with DX mix between live sets. "Obsession" have worked in 5-star hotel outlets in the Middle East, Japan, Jersey, Cape Town, Spain, Cyprus & Madeira including private engagements for "Calvin Klein" and the "Queen's Birthday Party" at the British Embassy in Doha. They have also worked on shows with famous British Comedians Bobby Davro and Jimmy Jones. Ray has worked in named British Bands such as Mungo Jerry who enjoyed many worldwide number 1 hits including "IN THE SUMMERTIME". He has also spent many years working on the cruise ships. Chris who started her musical career on the oboe has worked in function bands around the world and has spent many years entertaining, with her lively personality and sax!! "Obsession" aims to provide entertainment for all musical tastes and with a repertoire exceeding 500 songs they can easily read a crowd and adapt their musical choice accordingly. This fact is highlighted in many references / letters they have received. Using radio microphones both vocally and on the saxophones, their show is interactive and "Obsession" are renowned for building a lively rapport with the audience. Whether it is a cocktail party, a lively function or an evening of "just listening", Obsession can fit the bill!